Annette Krebs, born in Homburg-Saar. Since her childhood she is playing music. Today, her focus is on composition, improvisation and interpretation. After first studies in music with Manfred Ridil, she graduated at Hochschule für Musik und Darstellende Kunst Frankfurt am Main in 1992. Since 1993, she lives in Berlin as a musician and composer. I am working with sound. From the age of 18 to 23 I was dealing with painting as well, but my original language is music. Recently I have finished a cycle of works with a multi-speaker composition. This “Concert for 6 loudspeakers” is about the balance of words, sounds, noises and field recordings. It finishes a process of development for me. I do not like to repeat myself and that is why I will not perform it again but begin a new piece with different materials. Usually I work in periods of 3 to 4 years, doing researches about specific materials and structures. At the beginning of the last period I dissected words and integrated them into my Solo Set up. Then I extended that approach to my compositions of pieces for performers and loudspeakers. What was your initial interest to integrate tones, noises, words as well as field recordings into your compositions? I have always played different types of music. When I studied guitar and violin in Frankfurt am Main I worked with tones in a quite conventional manner. But at the same time, I did abstract paintings. At that time, the scene of contemporary music in Frankfurt am Main was quite small. I was looking for inspirations and one day I began to use my paintings as graphic scores. I played them on guitar and the next step was to discover my violin bow as a source of noises. So, I was working with tones and noises and when I came to Berlin, I began to develop an aesthetical approach to regard both as equal. Neither did I like to work with tones within the traditional harmonics nor did I wanted to use noises as decorations of tones. I wanted to rediscover the tone of the guitar and to free it from traditional associations and contexts. The first step to go this way was to place just a single isolated tone in a room and to research its qualities. I was interested in the sensual features of a tone or a noise. Why is it today that you can work with the tone of a guitar although you regarded it before as traditionally casted? This is a question of “Why” for me. When I am working on my music I ask myself: “What do I like to hear?” “What does not exist, yet?”. When I came to Berlin, my first approach was to dissect pieces by a 4-track recorder and to develop them. Then I entered the improvisation scene. Why did you decide to get into improvisation? I was doing improvisation all my life along harmony schemes as well as free. The scene was dominated by Free Jazz at that time. There, tones were often played accidentally to release a kind of abstract energy. But this was not my approach and I began to place single tones in quiet rooms to isolate and research them. When did you begin to integrate words into your compositions? Music is vitally important for me and it is an image of reality itself. I think making music always starts unconsciously with processing acoustic stimuli from the surrounding. May be the research of noises became interesting for the making of music when industrial noises began to dominate the urban space. Inspired by some of my earlier projects in which I had already integrated words and interviews into my music I began in collaboration with Steffi Weismann to integrate speech fragments. I was interested in the fact that words, whether those ones you think of or words you listen to, as well as noises and tones are part of our everyday life. An interesting fact is, that words even in day to day situations do not always consistently appear. If you stroll through a city you can often hear fragments of conversations and because they are detached from their original context they can create associations, colors and fantasy stories in your mind. Something like that, a kind of irritation can also happen when you listen to a concert and your own thoughts interrupt your listening and your mind is digressing. I like to integrate this aspect of reality, these detached fragments into my music. Don`t you think that words are even more associated with a definite meaning than noises are? That depends how you use and cut it. Words have a sound quality that can become dominant if a statement is not given in a narrative but in a repetitive way as you find it e.g. in shipping forecasts or in computer voices that just count numbers. These voices can have an emotional intensity without taking off the mind to much from the subject. That is why words became interesting for me as a sound material. Another approach is to cut words and sentences in so small pieces that they become just sound. Then they can serve as a source of free and accidental associations for the listener. Many people do like that but some people find it provocative to hear words distracted from their original context. How would you define the relationship of composing and improvising in your work? When did you start integrating field records? Field recording reminds me to photography. I often make records quite aimless and later on I select parts for a specific composition. Sometimes field recordings that were intentionally recorded in a special moment can be perfect by-chance-compositions that nobody could have designed before. In my composition “in between” I have worked with different types of field recordings. My piece was part of a CD to which twelve composers contributed one piece each. Everyone was allowed to hear just the piece of his predecessor and was asked to continue in his own way. 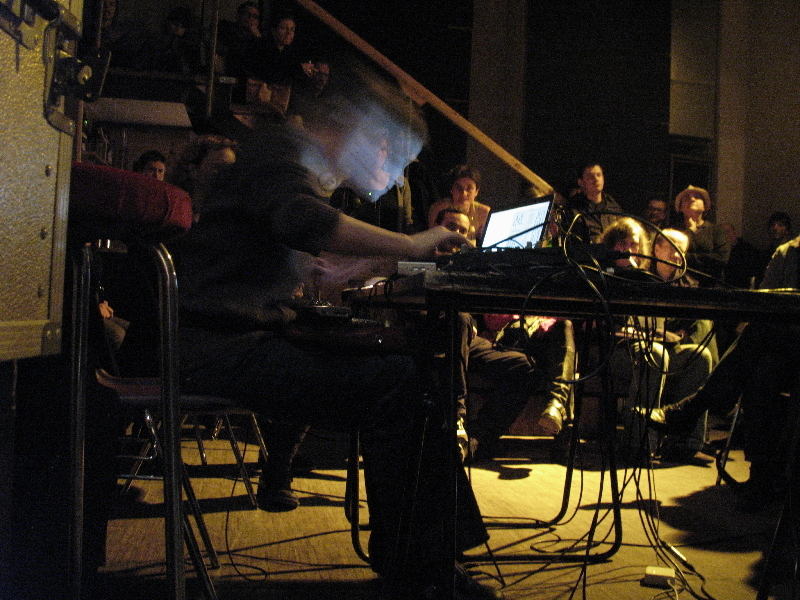 “In between” consists of tones, noises and field recordings. I work with these materials in a collage style. I shift places and voices into one another. In real life they are located in different countries but in my memories they are very close to each other. For my work I only use field recording with a personal touch and an individual story. My approach is polyphonic. In “In between” field recordings, voices and abstract musical material are equally interwoven. During the Anti-Wall-Street-demonstrations in Berlin last winter, two Berlin based musicians have organized a performance of a James Tenney piece. I was there on November 12th. Only a few musicians and demonstrators have been there. I did a record of one hour. I changed my recording position from time to time to give a special emphasis to a single instrument, the ensemble as a whole or the demonstrators. Listening the recording in the studio, I selected a part of 3:59 length that I liked very much in cause of its beauty and diversity. I only filtered out the wind because it was quite stormy that day. ← Johnny Chang, musician and composer, living in Berlin.